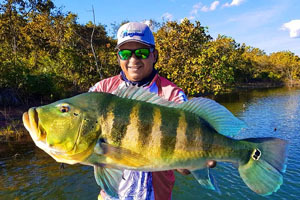 Brazilian angler Mariozan Gomes do Nascimento potentially set the new All-Tackle world record for blue peacock (Cichla piquiti) with this beautiful 5-kilogram (11-pound) fish that he caught and released on June 8, 2018 while fishing Lago do peixe Angical in the Tocantins state of Brazil. The current All-Tackle world record is 4.5 kilograms (10 pounds). 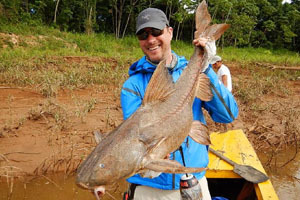 While fishing Bolivia’s remote Madidi River on June 21, 2018, American angler Arthur Weston potentially set the new All-Tackle world record for granulated catfish (Pterodoras granulosus) with this 7.93-kilogram (17-pound 8-ounce fish). Weston was fishing with cut bait and needed only five minutes to land the fish, which was quickly documented, weighed and then released alive. The current All-Tackle world record for this species is 7.26 kilograms (16 pounds). 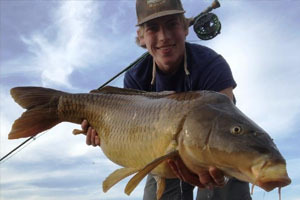 Angler Kurt Gutormson caught this 14.37-kilogram (31-pound 11-ounce) common carp (Cyprinus carpio) on April 30, 2018 while fly fishing Lake Poinsett, South Dakota, U.S. Equipped with a light tippet, Gutormson played the stubborn carp for 45 minutes until it could be subdued. If approved, the catch will become the new men’s 3 kg (6 lb) tippet class world record, which currently stands at 13 kilograms (28 pounds 10 ounces). 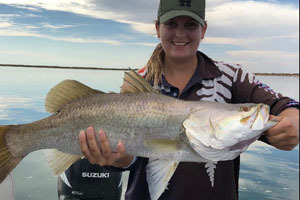 Aussie angler Shanae Cook potentially set the new women’s 2 kg (4 lb) line class world record for barramundi (Lates calcarifer) with this 4.13-kilogram (9-pound 2-ounce) fish that she caught on May 3, 2018 while fishing Australia’s Jones River. This world record category is currently vacant.